People Don't Understand The Invisible - AIM Services, Inc. These are the words of a traumatic brain injury (TBI) survivor who spoke at Tuesday’s Brain Injury Advocacy Day at the NYS Legislative Office Building in Albany. The event was held by the Brain Injury Association of New York State (BIANYS). The woman’s experience forever changed her life and has come with unimaginable challenges and pain. It has come with the loss of a home, a profession, and identity. Her sorrow is evident, yet her strength shines more brightly. I am the living example of Sisu, the Finish word meaning “perseverance”. It means that when you are the bottom of the bottom, you can rise above. She is not sure what her future holds; her career path for which she loved and worked so hard, is no longer an option. A mother of a 9-year-old daughter who experienced a TBI months before her sixth birthday, is concerned with advocacy, awareness, support, and provider and community resources. The woman’s speech outlined the experience of her daughter’s TBI and the lack of support she felt in the hours during her injury, and in the months and years afterward. She shared that it took 10 ½ hours for the emergency room doctors to finally acknowledge and begin to address the fact that her daughter was experiencing a TBI. Afterward, she found limited providers who would support her daughter, a lack of awareness from medical providers and the general public, and an absence of support groups. She and her family felt alone and unsupported. It has been a struggle to watch my daughter become a shell of herself. Her bright, insightful and inquisitive daughter became a completely different person in a single day. Although her sorrow was also evident, her outlook was that of strength. She listed her daughter’s improvements in the years since her injury and the positive outlooks from her doctors. She and her family will continue to advocate for themselves and for their community. A brain injury occurs after birth and is not congenital, degenerative, or hereditary. Some examples include stroke, exposure to toxic substances, oxygen deprivation, infectious disease and trauma. Traumatic brain injury (TBI) is caused by an external physical force, such as a motor vehicle accident, sports-related injury and proximity to explosions/blast injuries. A concussion is a mild TBI. On Tuesday, March 26, 2019, AIM Services attended the Brain Injury Advocacy Day in Albany. Attendees were able to hear fist hand from family members and survivors of brain injuries. The event, led by BIANYS, helped prepare those in attendance for legislative meetings with representative later that day. The meetings are a forum for individuals and support groups to speak directly to their legislatures to help grow awareness and demand legislative action on the behalf of those who have experienced, or who will ultimately experience, a TBI. In addition to this proposal, BIANYS is calling to Amend the 2011 New York State Concussion Awareness Act and to Establish a Brain Injury Trust Fund. To learn more about each issue, visit www.bianys.org. AIM Services provides a program of services designed to help individuals and their loved ones live a life of greater independence, enhance social opportunities and community involvement, and have good overall health and well-being. 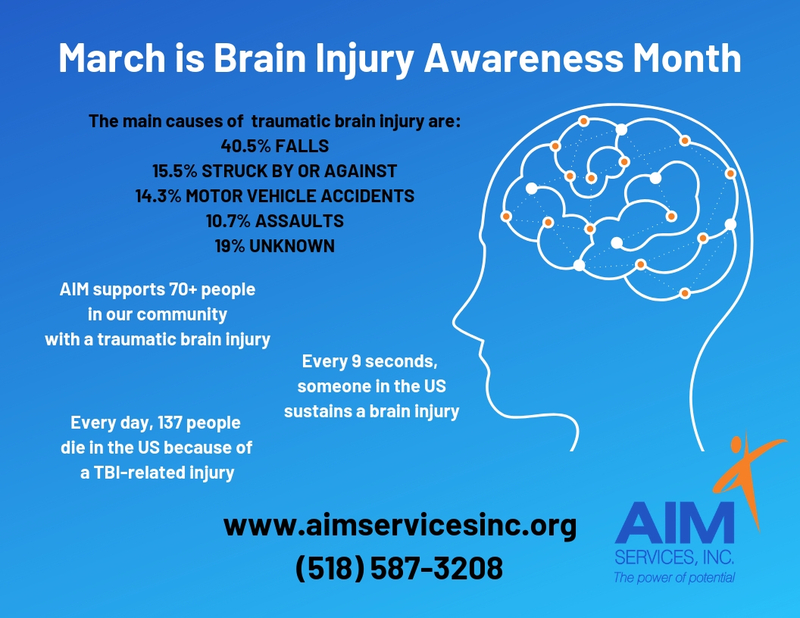 Our agency is concerned with the provision of all necessary services for this population of our community, as well as a much needed increase in overall awareness of the TBI Community. Services provided by AIM include Service Coordination, funding assistance when transitioning back into the community, independent living skills training, home and community support services, day program opportunities, provision of assistive technology, community integration counseling, environmental modifications, and social transportation. After this years’ Brain Injury Awareness Day, our agency members reflected heavily upon the immense struggle of anyone experiencing, or related to an individual experiencing, a brain injury. Imagine your child becoming a shell of themselves. To speak the actual words that you no longer recognize the child to whom you gave birth. Imagine everyone telling you how great you look, while your previous abilities silently disappear. 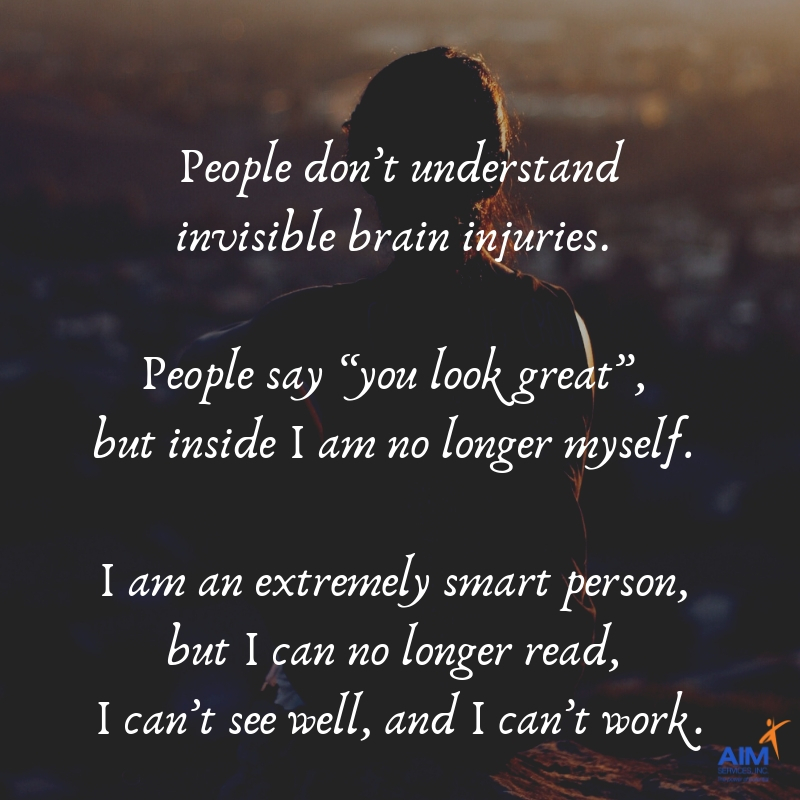 This is the invisible struggle of caring for, or being, a person with a traumatic brain injury. The Brain Injury Awareness Day created an opportunity for TBI Community members to advocate for themselves and others. We suspect that this day also inspired others to become more vocal and involved in promoting the needs of this population. A reported 500 people experience a brain injury EVERY DAY in New York State. This is a startling reminder of the awareness we must create regarding TBIs. It certainly was a reminder for our agency to be ever more vigilant in our responsibility to perpetuate understanding and awareness of traumatic brain injuries. To learn more about available support services for a Traumatic Brain Injury, Click Here. For further information and guidance regarding the process surrounding the Traumatic Brain Injury Waiver, contact Program Director of Department of Health, Diane Hall, at (518) 450-2889 or dhall@aimservicesinc.org.